Heart disease is the leading cause of death in Europe and the United States and according to the European Heart Journal (August 2014) is estimated to account for 29-30% of deaths worldwide. One study (J. Family Practice, July 2011) reported that more than 70 percent of U.S. women and men between the ages of 60 and 79 have cardiovascular disease. Cardiovascular disease is defined as a disorder of the heart and circulatory system, but is not a single disease. Coronary heart disease is the most common and preventable heart condition. It is caused by atherosclerosis, defined as a narrowing of the blood vessels that supply oxygen and blood to the heart. Other types of common heart disease include hypertension (high blood pressure), and atrial fibrillation (arrhythmias or abnormal heart rhythm). According to the Center for Disease Control, each year 785,000 Americans have their first heart attack and at least 470,000 people who have had at least one attack will have another. When considering medical services, medications and lost productivity, heart attacks were estimated to cost more than $316 billion in 2010. Heart disease does not discriminate. It is a leading killer for men, women and all major ethnic groups. Signs and symptoms of heart disease differ between men and woman, and it is sometimes unrecognized in women. Though men and women are equally at risk for heart disease, a recent survey found that 36% of women did not consider themselves at risk, even though heart disease killed one in four women in 2006. Men are at greater risk for sudden cardiac events, comprising 70 – 80% of those attacks. A 2009 study by the Centers for Disease Control and Prevention, found that women are often more frequently diagnosed with the disease, but men experience it more extensively and have worse long-term survival rates. The National Health Institute reports that half of the men who die of coronary heart disease had no previous symptoms. “Sudden cardiac death” (SCD) may be the first time you have any symptoms of heart disease! That’s why it’s important to have regular check-ups and eat a heart-healthy diet. The good news is that the most common types of heart disease are preventable and reversible 100%, naturally. Though the disease has slightly different consequences across genders, preventable heart disease risk factors for men and women are the same, and the CDC reports that nine out of 10 heart disease patients have at least one risk factor. These include high cholesterol, high blood pressure, diabetes, cigarette smoking, being overweight or obese (especially in the midsection or abdominal area where waist-to-hip ratio is key), poor diet, physical inactivity and heavy alcohol use. Heart disease can even be correlated to erectile dysfunction in men. Most of us have heard about cholesterol. Cholesterol is medically recognized as one of the principle risk factors in heart disease, but it is not the only one. C-Reactive protein (CRP) levels which indicates the level of inflammation in the body, is the other key factor, but is less well known. Cholesterol is a fatty-like natural substance produced in the body that is essential to cell function and certain hormone production. Cholesterol is produced in the body. Unfortunately too much LDL (low-density) cholesterol, commonly found in saturated animals fats, can create health problems. By learning the breakdown of the different types of cholesterol and triglycerides (stored fats-lipid) in your body you can have a clearer awareness of your risk factors. Generally speaking the lower the cholesterol the better. To know your current heart health state you need to know the breakdown of the different types of cholesterol and triglycerides (stored fats-lipid) in your body. Cholesterol, which does not dissolve in blood, travels through the blood attached to a protein known as a lipoprotein. There are two types of lipoproteins: low-density (LDL) and high-density (HDL). LDL is often called “bad” cholesterol because it contributes to plaque build up on the arterial walls. HDL, sometimes called “good” cholesterol helps get rid of the LDL in your blood (for more details see www.conscioushealthinstitute.org). LDL cholesterol particles are generally small and dense. They are frequently associated with low HDL cholesterol levels, elevated triglyceride levels, and the tendency to develop high blood sugar levels and type II diabetes. As cholesterol plaques grow they block blood flow in the arteries. A cholesterol plaque may at some point suddenly rupture. This results in a blood clot that forms over the broken tissue, which can eventually cause a heart attack or stroke. Statins are the most commonly prescribed treatment for lowering cholesterol. Despite commonly accepted opinion among biomedical physicians and public, they are not necessary for lowering cholesterol levels and cause serious side effects in the body. Diet is a key factor in heart disease since cholesterol is found in animal and dairy products. Its kinds and levels can be directly linked to diet, making diet a key factor in heart health. 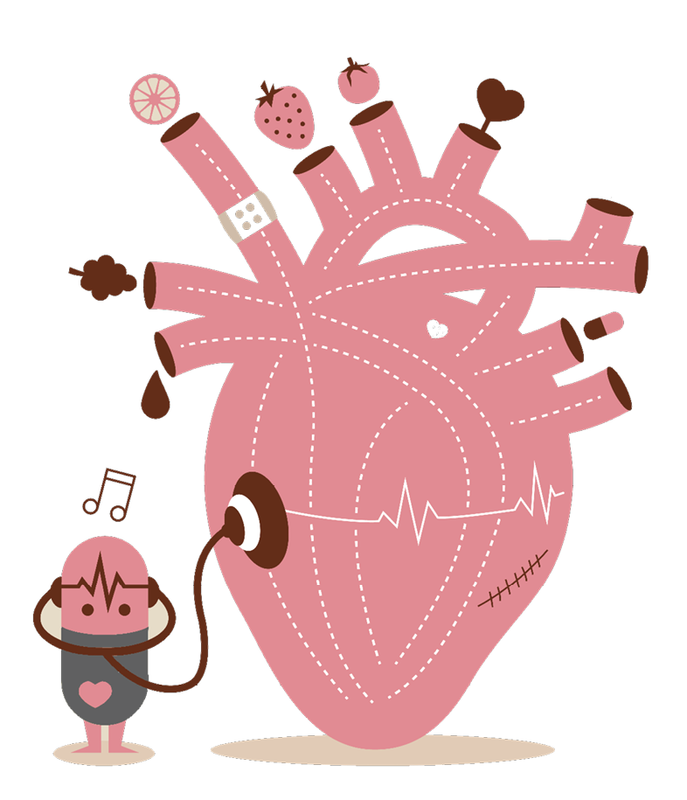 In our next article we will explore further the role of diet in the prevention and treatment of heart disease. In Part 1 of Heart Health, I discussed the critical role that cholesterol and inflammation (CRP) play in your heart’s health. Their levels are related to what we eat. There are enough reliable nutritional studies to confidently say which diets prevent or even reverse heart disease and which promote it. Coronary heart disease (CHD) or arteriosclerosis, diabetes, hypertension, obesity, dementia and even erectile dysfunction are all related to each other. They all share a common underlying condition, which is preventable and treatable through diet. Refined sugars and refined carbohydrates, which convert easily to sugar, and cholesterol imbalance are the principle sources of the most common health problems in Western countries. Cultures and societies with low rates of heart disease have a heart healthy diet and more active lifestyles. Data point to the fact that the lower the quantity of animal products in your diet the lower your chances of heart disease. A plant-centered diet has low levels of bad LDL cholesterol and is the most effective primary prevention for heart disease (J. Am. Acad. Nurse Practitioners, 2010). According to the European Journal of Clinical Nutrition (2011), there is a 34% lower risk of CHD for those with diets higher in fruits and vegetables. What is popularly known as the Mediterranean diet can cut the rate of CHD by as much as 70%. The key ingredients that make this diet effective are an increase in veggies, nuts, and olives and the elimination of processed foods and sugars and low animal fat consumption. 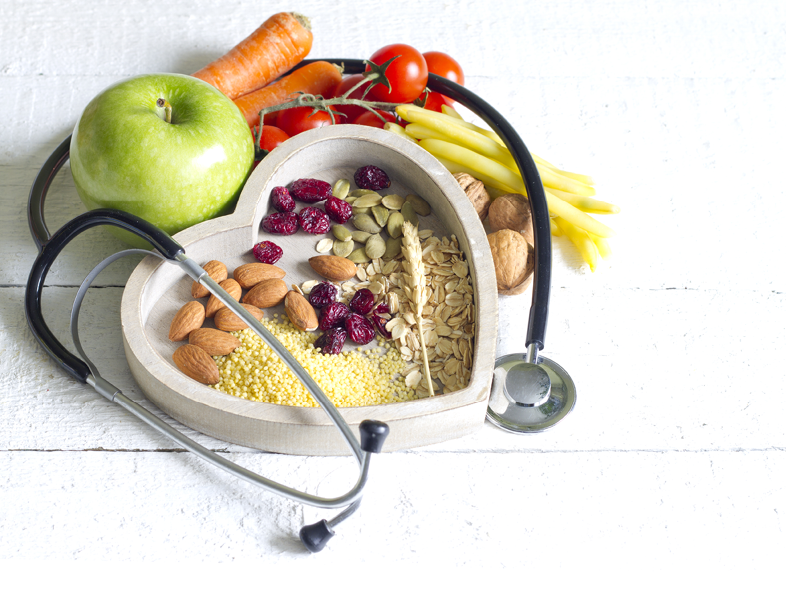 Research and statistics clearly show that a plant-based or plant-centered diet high in fiber, low in saturated and trans fats (solid at room temperature) and sugar is optimal for keeping the heart healthy. A diet that emphasizes vegetables, legumes, fruits, unrefined whole grains and nuts is optimal. Nuts in particular show an amazing ability to reverse plaque progression in arteries and cut the risk of strokes (PREDIMED, 2014) For people who do not want to eat a plant-based diet, reduce the amount of red and white meat and eggs and instead eat fish with larger portions of vegetables, legumes, nuts and fruits. Omega fatty acids play a key role in cell and hormonal function. One in particular, omega-3 fatty acid, helps reduce the presence of cardiovascular disease and inflammation and increases good HDL cholesterol while reducing LDL cholesterol. It is only available from certain food sources. Omega-3 is found in higher concentration in fish, like sardines, salmon, trout, cod and krill. For vegetarians and vegans, there are non-animal sources of omega-3, like flax and chia seeds, almonds, walnuts, aglae, mache, and olives. A 2010 study (Pmed) found that increasing polyunsaturated fat (found in vegetables like soybeans and olives) in place of saturated and trans fats from animals, results in a significant decrease in instances of heart disease. Being overweight (particularly a large waist size) or obese is a significant risk factor for CHD as well as diabetes. Eating a low calorie diet and getting enough exercise is critical. In addition to helping maintain a healthy weight, apples, almonds, walnuts, chickpeas, grapes, and blueberries stand out as particularly beneficial for the heart. Refined flour and sugar can cause weight gain, glucose and insulin imbalances and inflammation, which creates the perfect conditions for heart disease and diabetes. Uncontrolled blood sugar levels found in diabetics, increases the risk of heart disease. The American Heart Association estimates that at least 65% of diabetics die of some sort of heart or blood vessel disease. People who ate soy, nuts and certain fibers were able to lower their cholesterol levels more than those who ate a diet low in saturated fat, thus further lowering the risk of heart disease and stroke (JAMA, 2011). Flavonoids (phytonutrients and antioxidants), found in fruits and vegetables are especially high in onions, citrus, green tea, berries, red grapes and wine, dark greens and chocolate, have a particularly beneficial effect on the heart. This is good news for chocolate lovers, if you eat chocolate with high coco levels and low sugar. Flavonoids can enhance the function of the lining of blood vessels and inhibit cellular inflammation in ways that exceed other compounds. For maximum heart health, avoid foods containing partially hydrogenated vegetable oils, palm oil, cholesterol, and high-sodium. These are often found in large quantities in processed or packaged and junk foods. Most people consume nearly double the sodium they need, and many packaged foods and restaurants use higher than healthy quantities. High sodium also contributes to hypertension. The average person could easily cut their sodium intake by half and would benefit greatly and not miss it. A healthy diet doesn’t need to be boring or difficult to achieve. You don’t need statin medication to lower bad cholesterol. Start with small changes, and your body will adapt. There are many more dietary options available now than in the past. Businesses and restaurants are changing to fit the needs of healthy-wise consumers. 1 All suggestions made are general and provisional. Health decisions should be based your unique needs and condition in consultation with a trained medical professional.